Saturday is half price day! 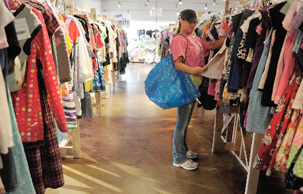 At the JBF sale, you’ll find everything you need for kids newborn through teen. We sell kids’ new and gently-loved clothes, shoes, toys, games, books, baby gear, furniture, nursing/maternity items and more! Bring your biggest shopping bag and your BFF to this incredible event! You can also join us in Davis County. 9a-1p | Half Price Sale! Free admission tickets, most items 50% off! "They are very organized, and have great things to buy." I love the variety of goods. We especially enjoy cthe books we find. I get it! Raising kids is expensive! JBF is here to make it affordable for Utah families. I love being able to get everything I need for my kids age 11, 8 and 5 each season without breaking the bank. They always look forward to sale time! Dad does too, because our kids look like a million bucks on a budget.